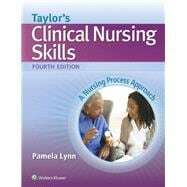 Taylor’s Clinical Nursing Skills: A Nursing Process Approach aims to help you learn the nursing skills necessary for safe and effective patient care. The text includes unexpected situations that you may encounter, along with related interventions for how to respond to these unexpected situations. With both basic and advanced skills, this text will be an essential resource to you across the curriculum and throughout your career. The Test Generator has over 500 NCLEX®-Style questions to help you put together exclusive new tests from a bank with questions spanning the book’s topics, which will assist you in assessing your students’ understanding of the material. PowerPoint Presentations, provided for each book chapter, enhance teaching by providing key visuals and reinforcing content. Skills Lab Teaching Plans walk you through each chapter, objective by objective, and provide a lecture outline and teaching guidelines. A Master Checklist for Skills Competency is provided to help you track your students’ progress on all the skills in this book. A sample Syllabus is provided to help you organize your course. WebCT/Blackboard-Ready Materials can be accessed on thePoint, plus access to all Student Resources, including Watch & Learn video clips, Practice & Learn activities, and Concepts in Action Animations. The Image Bank provides free access to illustrations and photos from the textbook for use in PowerPoint presentations and handouts. NCLEX®-Style Review Questions correspond with each book chapter for review of important concepts to help you practice for the NCLEX examination. Watch & Learn video clips, Practice & Learn activities, and Concepts in Action Animations demonstrate important concepts related to skills. Journal Articles offer access to current research available in Wolters Kluwer journals. Dosage Calculation Quizzes provide opportunities for you to practice math skills and calculate drug dosages.